I’ve been rummaging in a variety of boxes, because with “Leaving the Tyne, 1915” finished and on display, and two “Dreams of Amarna” pieces in a good state, I feel as though I have a bit of mental space and time to consider, not just the progress on the Dreams of Amarna, but also any other half-thought-through bits and pieces I may find. I’m not sure whether that is going to be true, but I live in hope! These “bits and pieces” are particularly obscure and particularly hard to find something to do with. These two Lovely Ladies were part of an exploration of stitch ideas and silhouettes, originally with the idea that they might become teaching pieces. They originate with a sampler of cross stitch and ribbonwork silhouettes I devised in “DevaStitch Designs” days. 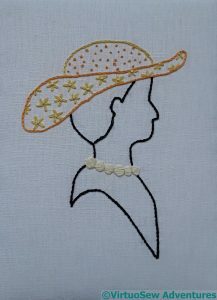 When I thought of teaching, I extended the idea by enlarging the heads, and playing with stitchery to replace the ribbonwork. 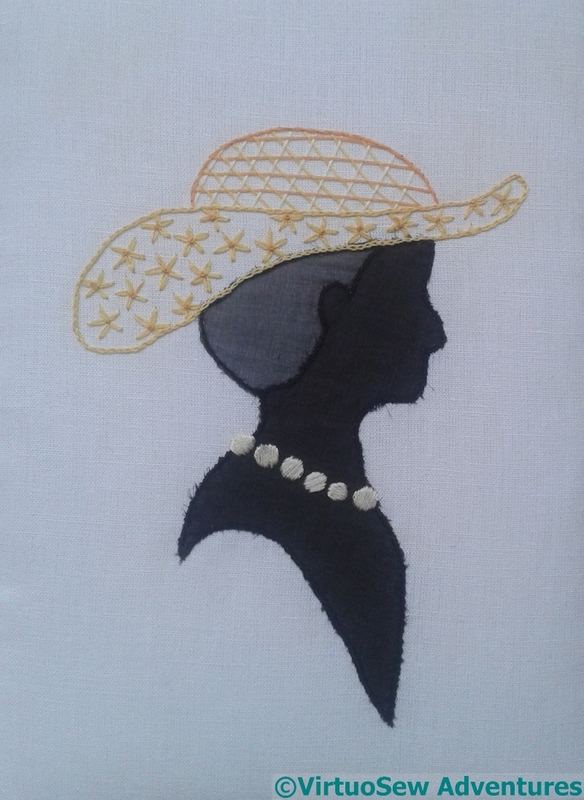 However, I’m not much of a teacher at the best of times, and when I asked a few people, I was told that the second version, with silk georgette layered to create the impression of the silhouette, would be daunting for beginners, and uninteresting for improvers. So I’m still trying to work out what to do with them. I rather enjoyed doing the silk georgette (it’s held down with back stitch, then chain stitch, and then satin stitched over the top! ), and it certainly makes the bead necklace stand out nicely. The two parts of the hat provide clear, distinct shapes to outline and fill with stitched patterns. I still have some ideas for a lady in the cloche hat that I’m dying to put into action, but at the moment I have no good excuse to do so! Finally! Crazy Paving Canvaswork finished! 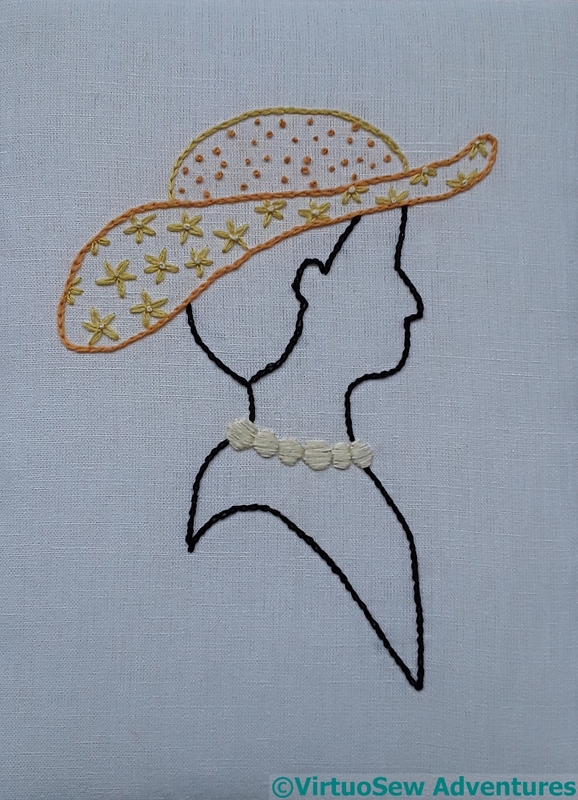 What an elegant way to showcase different stitches. I like Annis and her hat. I used to have a pair of small oval brass photo frames that were designed to stand on a mantlepiece or a dressing table. Your ladies would look good in something oval like that. While the stitch sampler idea doesn’t quite fit with doing fiddly silk applique for the faces, it would fit with a screen-print, perhaps with multiple heads on one panel (for a cushion, perhaps) hat-outline and face silhouette ready for trimming with fancy stitches and perhaps further trimmings of the stitcher’s choice? A great way to teach different stitches. Oh those are pretty!! I love how by simply changing how different elements of the design are worked you get an almost completely different look. My honest opinion, if you had decided to teach it… this design could quite easily have been adapted to take a beginner from basic stitches to more advanced techniques. Now there are some people who all they want to learn are the basics and no more. But that doesn’t mean that there aren’t lots of people out there who don’t want to challenge themselves to go farther. And by using the same design, they’d be able to see their progress in a very tangible way. Thanks so much for linking up to this week’s Stitchery Link Party. Aloha hugs! These are a couple of really lovely pieces! I like the simplicity of the first one, and the second one is a such a lovely silhouette. I think teaching seems to go in ‘flavours’, and you have to be lucky enough to be ‘in vogue’ at the time, or nimble enough to adapt to the needs and desires of students. If you could get them printed onto cards, they would be lovely cards or postcards, they have a very ‘classy’ feel about them. Good luck getting the head space you need! unintersting for improvers? I beg to differ. Improvers generally embrace and devour all shared knowledge in my experience. Such a lovely way to learn different stitches. These ladies look so refined and elegant. 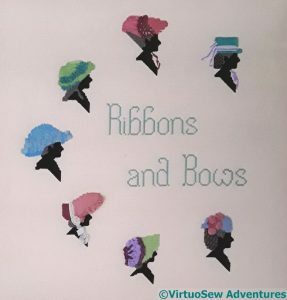 Great project for teaching as students would come away with something gorgeous.